Learn Spanish in Guadalajara and you’ll never forget its colourful colonial streets and irresistible fiesta atmosphere! Mexico’s second city is a lively metropolis where there are endless distractions, from rodeos to theatre, open-air markets to stylish nightclubs. Yet there are also oases of calm within this most active of cities. Within walking distance of our centrally-located school are peaceful parks, where you can chat to locals in Spanish. Guadalajara is simply overflowing with culture and history, boasting grandiose palaces, awe-inspiring cathedrals and some fine artworks. Take a break from sightseeing or shopping to relax with a coffee or to sample excellent local specialities like molcajete (meat stew). If you want complete relaxation, the beautiful beaches of Puerto Vallarta and other Pacific resorts are within easy reach. 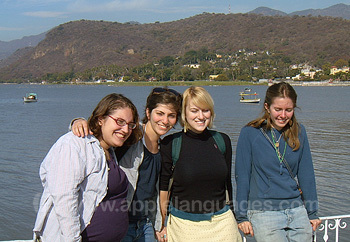 25% off Spanish courses in Guadalajara! Book 5 weeks or more at our Spanish school in Guadalajara and get 25% off the price of your tuition! Plus get 15% off a 4 week programme. Offer does not apply to accommodation. The very heart of Guadalajara is home to our Spanish school, with countless colonial relics, museums and shops nearby. Facilities at the school are excellent, including a multimedia lab (with over 40 computers), free wireless Internet access and a movie auditorium. Class sizes are kept to a maximum of just six students, so you can spend plenty of individual time with teachers, quickly improving your Spanish! Friendly school staff are available 24 hours a day to help you with any problems you may have. Get to know other students, and put your Spanish to constant use, with 20 group lessons per week on our school’s Intensive course. 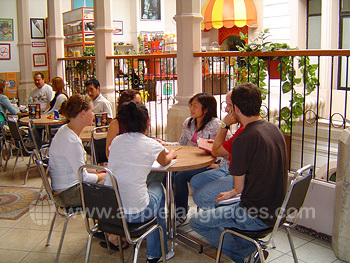 Discussions, role plays and general conversation within the group are all included in this Spanish course in Guadalajara, giving you valuable Spanish speaking practice! You may prefer to have Spanish tuition on a one-to-one basis though. 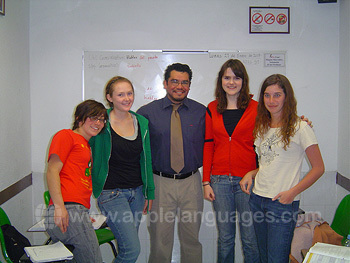 For either five, 10, 15 or 20 Private Spanish Lessons each week, you’ll have the undivided attention of our expert teachers. 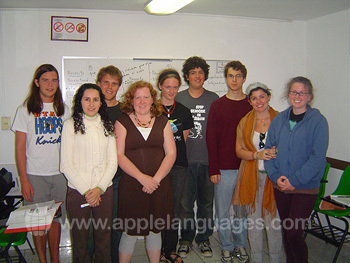 They will help you to identify and concentrate on ways to rapidly progress your understanding of the Spanish language. 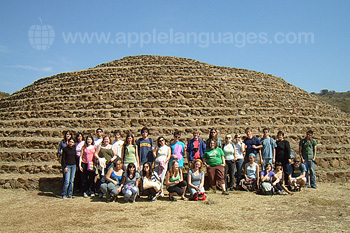 If you want to learn Spanish in Guadalajara for a specific purpose, our school can tailor Spanish courses to suit your needs. There are programs available in Business Spanish, Spanish and Latin American Literature and Spanish Conversation, amongst other subjects. For additional information on any of these Spanish courses, please contact us. Enjoy the warmth and hospitality of the Mexican people, as well as plenty of Spanish practice, by staying with a local host family in Guadalajara. 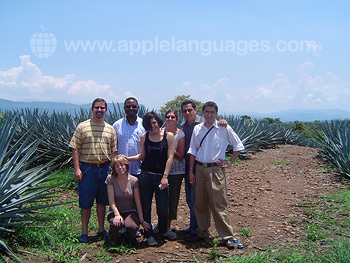 You’ll become completely immersed in the language, as well as the Mexican way of life. Your family, carefully chosen by our school, will provide you with three meals each day, so you can also discover delicious Mexican cuisine! If you’d prefer to live with a mixture of students and travellers from all over the world, choose accommodation in one of our school’s shared apartments. You’ll have your own private room, with en-suite bathroom, and share kitchen and laundry facilities. For a high standard of accommodation, right in the historic heart of Guadalajara, our school can arrange discounted rates for you at a wide range of hotels. The school can also recommend private apartments in the city, should you prefer that option. So that you enjoy yourself as much as possible whilst you learn Spanish in Guadalajara, our school organises a package of extracurricular activities. Salsa lessons, a city tour, guitar lessons, ceramic crafts workshops and talks on Mexico are all regularly offered! Language and cultural exchanges are also arranged, where you can chat to Spanish speaking students who are studying English, giving everybody a chance to hone their language skills! Our school also runs a variety of excursions, allowing you to see some more of Mexico and, in particular, the state of Jalisco. You can visit the ancient Guachimontones Pyramids, Tequila (home of the famous Mexican drink) and Lake Chapala, Mexico’s largest lake, amongst other places. Transfers from Guadalajara Airport are available through our school, for a small extra fee. 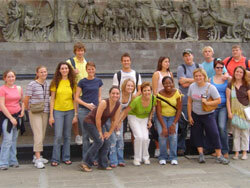 Please contact us with any questions you may have regarding our Spanish courses in Guadalajara.